he Artisans have a wealth of teaching experience in different educational contexts. Collectively they have taught all ages and have taken music workshops for both children and adults in many music centres, schools and festivals. These have included work at Aldeburgh Young Musicians, the Dartington Summer School, The Centre for Young Musicians, Spitalfields Festival and Brighton Early Music Festival. The Artisans have a varied programme of interactive workshops for different ages and settings. From the Middle Ages to the Tudors there are a variety of workshops exploring a wealth of early music. For enquiries see contact page. "Emily Askew's workshop as part of the Early Music Festival in Brighton was thoroughly enjoyed by the whole school. Singing folk songs, listening to energetic tunes and even finger dancing were all part of the fun!" 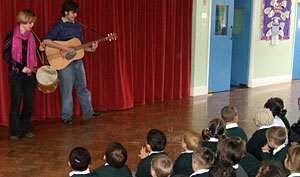 Visit Askew Music: Music workshops in schools.